After leaving Malta, I took a low-cost flight with Ryanair to Bologna for $75, a bus to the Central Train Station for a couple of Euro, a train to Rimini for $20 and then a bus for $7.50 to find myself in what is known as the “Most Serene Republic of San Marino”. San Marino is a micro-country of just 61 square kilometres with a population of just 32,000 people nestled in the northeastern peninsula of Italy near the city of Rimini. This country is noted as the oldest surviving sovereign state and constitutional republic in the world. I spent three nights and two full days in this European country before moving on to my next destination. I would advise that this is sufficient time to enjoy the sights and surroundings. I enjoy all the public transportation options that exists in Europe, even in the smallest of countries. This leg of the journey involved planes, trains, buses and automobiles. It was lovely to see the snow-covered Italian mountains from the plane, but a little chilly in Bologna with snow covering the ground. I was very happy that I only have a couple of minutes to catch my train versus waiting in the chilled air of the Central Station. If I had known more Italian, I could have had a great conversation with an older woman who was travelling home after a nice visit with her granddaughter. You can purchase your return bus tickets to San Marino at the Tourist Information Centre for 10 Euro. I basically had a private ride on the bus to my hotel that night, saving the 50 Euro taxi ride. The hotel shuttle unfortunately was not the Lamborghini shown below. It was at the airport and I had to snap a picture. A ride in it would simply be amazing! The Grand Hotel San Marino was simply perfect – an amazing view from the balcony of the mountains, delicious food at the restaurant and an extremely help staff. Upon arrival after being awed by the bright lights I decided to check out the restaurant. I ordered the Menu of Tradition which consisted of bread to start, Italian salami with mousse of cheese, potato gnocchi with porchini mushrooms and gratinated green lasagne, the second course claimed a small mix of grilled meat from the territory and seasonal vegetables. Dessert was homemade cake with mascarpone and coffee cream. It was a little overwhelming all the first plates I would eat that night, but I ate like the locals and feasted for quite some time. When I requested my typical espresso, I also received some powdered biscuits. It was unbelievable for 25 euro. Needless to say, I was unable to have breakfast the next morning. On my last evening in San Marino, I decided to return to the hotel restaurant and it was recommended I try to the fish tasting plates, which consisted of Scottish salmon with brioche bread and curls of butter, tar-tare of sea bass marinated in soy and lime, swordfish carpaccio with pink pepper as an appetizer, noodles drawn in bronze with local sepia, clams, mussels and calamari as a first plate, the second catch was an assortment of grilled local sea fish and dessert was a lemon sorbet with a caramelized piece of fruit and a coconut cookie. The food was simply amazing, high-value and very well-priced. I would only imagine as tourism season begins the menus are adjusted. The morning or evening views were so enjoyable. I just would sit and read and sometimes just stare off into the distance, reflecting upon the Maltese experience, the wonder of San Marino and the next steps of my journey. I would also get lost in local author and Newfoundland and Labrador’s favourite storyteller, Earle B. Pilgrim as I turned the pages of the Day of Varrick Frissell. It was intriguing to read about the tragic event on the sealing ship the Viking of the Great Northern Peninsula that should have brought so much more promise and attention with a film crew getting the last images needed for a film “White Thunder” that would be produced and distributed by Paramount Pictures. I enjoy reading on vacation and this time I decided to take a little piece of home with me. Exploring San Marino was easy by foot, but one has to be prepared to walk up and down multiple stairs or inclines given the terrain of this fortress city. There are three towers that are a must when visiting, getting panoramic views, seeing the gardens or visiting the museums. such as the armory in tower two. There is a nature park that allows you to circle around the city and give you a tranquil feeling of being in the great outdoors. I toured the palace and House of Parliament, cathedrals, museums, galleries and shops. I enjoyed a couple of local brews and a nicely prepared diavola pizza. There are more than 20 sites and attractions listed on their map and I was able to see most of them, enjoying the walk down to the Museum of Natural History but taking the cable car back up to the main city. The San Marino guide was a great publication outlining the area attractions, local business and events. There is still value in print and publication to promote a region to travellers. 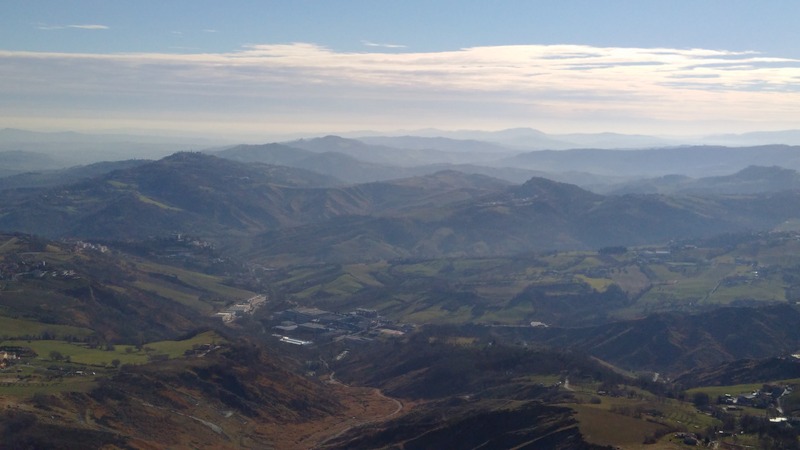 No question, there were times when I felt I was the only tourist in San Marino, but there were others enjoying the peacefulness of the countryside. Tourism is peak during the summer, but in San Marino they too treat it as a year-round business. It lives up to its slogan of serenity and for me – a mountain of relaxation. 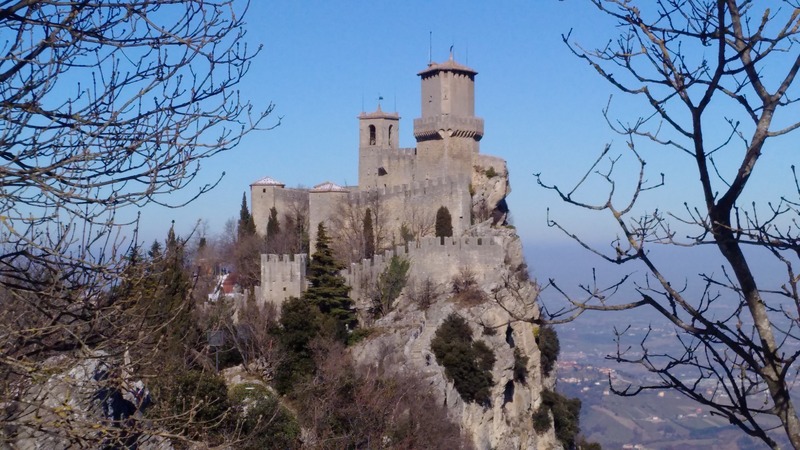 If you want a couple of amazing days to rejuvenate, add San Marino to your list. The next leg of my travels took me to Expo 2015 in Milan, Italy! Posted on February 23, 2015, in Vacations and tagged europe, Food, Great Northern Peninsula, Newfoundland and Labrador, Rural, san marino, tourism, Travel, Travel and Tourism, vacation. Bookmark the permalink. Leave a comment.